The Career Services Center at UMBC also put together this handy list of career options for history majors. 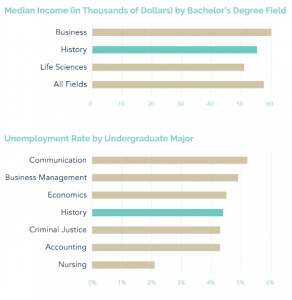 And check out this report that shows that humanities and social science students out-earn over the course of their careers those with pre-professional degrees – especially if you get a graduate degree at some point. Click here for the article from the Chronicle of Higher Education. 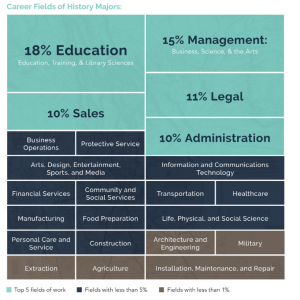 Finally, the American Historical Society published a study in 2018 on the career options of history majors. The publication can be found in its entirety here. The publication contains helpful graphs which break down the career paths of history graduates along with discussions of the kinds of skills historians can use in applying to jobs. Finally, the publication stresses the utility of a history degree, discussing how the skills of history can equip students for success in the modern economy.